CES, the most prominent consumer electronics show, brings all new gadgets across the globe under one roof with a glimpse into the future each year at the beginning of January. With 4,500 exhibiting companies in 2.9 million square feet of exhibit space across Las Vegas, CES 2019 is the world’s most significant innovation event whe re tech giants to small startups unveil cool gadgets they have been building all year long. It welcomed the world’s biggest companies in addition to hosting more than 1,200 startups. CES spotlighted many of the innovative technologies, including 8K TVs, 5G, AR, VR, AI, Robotics, Sensors, Cars, Activity Trackers, Smart Cities, etc. More than 188,000 industry professionals, including more than 63,000 from outside the U.S., convened in Las Vegas to witness the groundbreaking technologies at CES that drive the future. There were plenty of exciting new gadgets across every corner of CES 2019 expo, but below are few that stood out from the crowd. No smartwatch has been equipped with a real FDA-cleared blood pressure tracker as Blood pressure tech is hard. Omron which introduced a wrist cuff to track blood pressure last year, and now it got FDA clearance to introduce it in a smartwatch. Omron HeartGuide is the first wearable blood pressure monitor bundled in a smartwatch and will start shipping right away for $499. The Apple watch series 4 is the first wearable that allows the average person to measure ECG, but Withings' making it much more affordable. Series 4 (with the $400 price tag) also requires accompanied iPhone to measure and track ECG, and the combination is not affordable for many people. Withings’ Move ECG will cost a fraction of the price, just $130, thus making the technology far more affordable and accessible. Withings is launching Move in the second quarter of 2019. The true debut of 8K TV has finally happened at CES 2019. The largest TV makers Samsung, LG, Sony along with TCL announced they would be shipping 8K TV models this year. Whether the content is ready or not, the TV makers are ready to sell 8K TVs this year in North America. Samsung is offering 8K QLED TVs in five sizes: 65 ($4,999), 75 ($6,999), 82 ($9,999), 85 ($14,999), and of course the behemoth 98-inch model (price unknown). LG is introducing 88-inch Z9 OLED, and four LCD-based NanoCell models SM80, SM85, SM90 and SM95. Sony debuted 85- and 98-inch versions of its XBR Master Series Z9G 8K Android TV LCD models. TCL announced its X10 QLED 8K TV and 75-inch Roku TV 8K 8-Series 8K model with QLED. LG, Sony, and TCL are yet to announce pricing for their 8K models. This isn't the first time LG demonstrated rollable OLED at CES, but it is the first time showing the final product that's being shipped by year's end. LG showcased a 65-inch prototype OLED TV that rolls out like a paper from a small rectangular box. When not in use, you can roll the entire TV into the same box with a touch of a button on a remote. LG demonstrated 18-inches display at CES in 2016, a 65-inches prototype at CES in 2018, and the final product at CES this year. Pricing is unknown at this point. Samsung’s modular TV dubbed as “The Wall” is the answer to the question - why your TV has to be of same size or shape? Samsung position it as the first modular TV and it lets users alter the size and shape of the TV in the living room. 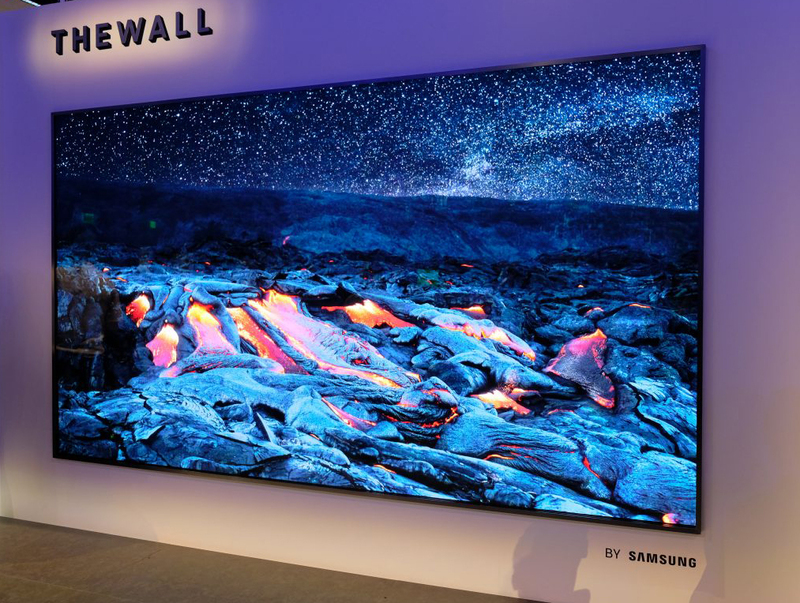 At last year’s CES, Samsung introduced the critically acclaimed, award-winning 146” Micro LED display by unveiling The Wall and this year it got even bigger with 219”. I tried all sorts of robot vacuum cleaners from iRobot to Ecovacs to Samsung to Neato, but none of these can do a perfect job when it comes to path planning or mapping. Even with advanced mapping sensors, laser, and camera, these will go randomly and do not remember the path correctly resulting in either cleaning the same area again and again or it doesn't even clean the area at all. However, Ironpie is a new robot vacuum from Trifo for just $299 promises to address this problem with its Intelligent Robotic Vision System called as TIRVS. It is a combination of "highly optimized software of proprietary innovative algorithms, highly optimized software, and scalable reliable hardware. TIRVS provides both high performance and cost efficiency on sensing, perception, and decision, 3 core pillars of a robotics system". It uses TIRVS to track its position and can remember where it's already cleaned. ForwardX Robotics, the global artificial intelligence, and mobile robotics company made a suitcase that will follow you around the airport using AI-powered computer vision. HTC added Tobii eye-tracking technology into the new Vive Pro Eye Virtual Reality (VR) Headset. Both companies demonstrated the Vive Pro Eye and its eye-tracking features at CES. SportsArt, the leader in fitness equipment, debuts the world’s first energy-producing treadmill, the Verde. By walking, jogging, or running, you can generate up to 200 watt-hours of utility-grade electricity. Similar to those found in solar panels and wind turbines, this treadmill converts the generated power into a consumable form and stores into a facility's electrical grid. La-Roche Posay Unveils My Skin Track pH, the first-ever wearable sensor and companion app to measure personal skin pH levels and create customized product regimens to better care for skin. It is a small, flexible patch-like sensor captures trace amounts of sweat from your pores to provide an accurate skin pH reading in just 15 minutes.